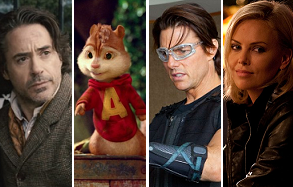 A wise-cracking detective will have no problem fending off singing chipmunks, an international spy and a sharp-tongued author at the box office this coming weekend. Sherlock Holmes: A Game of Shadows promises to be a sizable international hit based on the $524 million global haul of its 2009 predecessor. Star Robert Downey Jr. is as bankable as they come right now, and the film's marketing blitz promises more of what made the original such a huge success. Facebook activity on the Sherlock Holmes page is quite impressive, while the sequel is only barely outpacing the original on Twitter. Subscribe to Boxoffice Pro for full Facebook and Twitter data. As of 3 p.m. PT, Fandango reports that A Game of Shadows is responsible for 26% of daily sales. Sherlock Holmes: A Game of Shadows looks poised to take in $63.5 million from more than 3,600 locations during its debut frame. Expectations for Alvin and the Chipmunks: Chipwrecked have been toned down on the heals of two high-profile, under-performing animated sequels: Kung Fu Panda 2 and Happy Feet Two. It's quite possible that adults who are sick of moaning and groaning through the flicks will simply come up with an excuse not to take their kids this time around. Yet even if some drop-off happens, there will be enough of an audience to justify 20th Century Fox's investment. Fandango reports that Chipwrecked is responsible for a solid 8% of daily sales. Look for Alvin and the Chipmunks: Chipwrecked to grab $33 million from around 3,700 locations. Paramount is unveiling Mission: Impossible - Ghost Protocol a week early on IMAX screens. Based on early enthusiastic reviews, it's clear that these advance screenings will help the action flick gain an advantage over the rush of releases on the 21st, 23rd and 25th of this month. Ghost Protocol accounts for an impressive 16% of Fandango's daily sales. Expect Mission: Impossible - Ghost Protocol to take in $13 million from 400 IMAX locations. Young Adult expands to wide release this weekend after a platform opening last weekend. If enough people who enjoyed Cameron Diaz's turn in Bad Teacher show up to watch Charlize Theron's similar performance then the dark comedy could become a nice bit of counter-programming to all the family-oriented flicks hitting theaters. Young Adult should bring in $7 million from around 1,000 locations. Sherlock Holmes: A Game of Shadows Dec 16, 2011 Warner Bros.